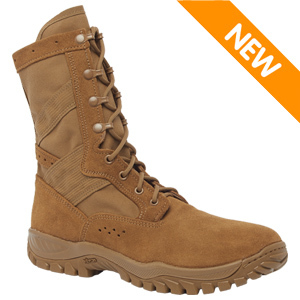 The Belleville C320 ONE XERO Men's OCP ACU Coyote Brown Ultra Light Assault Boot was designed for the newest OCP Army Combat Uniform (ACU). Soldiers will appreciate this lightweight tactical boot during intense physical activity or rucking in hot weather settings. The C320 boot features an Ultra Lite performance midsole that with a 32% weight savings over standard foam midsoles. This boot is designed for hot weather with dual zone venting around the ankles and insoles to keep all parts of your feet cool and dry during intense physical activity. Double strobel-stitch construction reinforces all parts of the boot upper to ensure these boots can stand up to punishment in the field. The Vibram Incisor features directional lugs and bars to provide superior traction on loose and uneven terrain. The Belleville C320 is approved for U.S. Army uniform wear and meets AR-670-1 regulations. This boot is Berry Compliant and proudly made in America.